Ramba is known as the last circus elephant in Chile, although her circus life began in Argentina. Ramba lived the life typical of a circus elephant, endless days of traveling, riding in a truck, then being chained in a small pen, being on the receiving end of dominance teaching techniques, all so she could entertain a crowd with silly tricks for 5 minutes. Ramba was confiscated from the circus “Los Tachuelas” in 1997, by SAG (the Agriculture and livestock service in Chile) for issues relating to abuse and neglect. Although she was officially “confiscated”, Ramba remained with the circus, but was not allowed to perform. Ecopolis, a small NGO in Chile, started a campaign to have Ramba removed from the circus, where she continued to lead a solitary and abusive life, and relocated to a home where she would be properly cared for. It took years, but eventually they were given permission to remove Ramba from the circus. They contacted a local safari park (Parque Safari in Rancagua) and asked if they would be willing to help. The safari park built a small barn and fenced off an area for her new habitat, they also dug a new pond and planted willow trees on the resulting island for additional enrichment. Ecopolis attempted to move Ramba, but could not get their expert to get her loaded onto the transport trailer. After the first attempt, Ecopolis was given one chance to move Ramba, or she would spend the rest of her life with the circus who had been cited for numerous counts of negligence. Scott and Kat Blais, who had been in contact with Ecopolis for over a year, were asked to come to Chile and try to relocate her. Although funds were not available for them to receive compensation for the trip, it was scheduled due to the ultimatum of Ramba’s last chance, and they arrived at the end of December 2011, two days after the email asking them to come. Although the day of the move was less than smooth, with issues involving the circus and police protection, Ramba graciously boarded her transport trailer and was brought to her new home. Arriving around midnight, after a long day, she easily stepped off the trailer, ignored her fruit, and enjoyed a simple pleasure most elephants are denied, gathering a trunkful of fresh live grass and eating it. She ignored her audience of supporters who were delighted to see her there, continued to dust, inspect her property, and after everyone but the staff had left, she even laid down for a nap. She made herself right at home. Her home at Parque Safari was only supposed to be a temporary solution; eventually the hope was to get Ramba to sanctuary in the US. The road to getting Ramba to the US has been an arduous one, and the US is now no longer an option for her, which means finding another solution. Ecopolis has always understood the need for her to be with other elephants, with the freedom to wander over many acres, in a place where she would be treated with kindness and respect. Unfortunately, this is not a possibility for Ramba, and now another alternative must be found. Ramba is quickly showing why a large space is necessary to maintain an elephant. Her beautiful willow trees have been decimated, large sections of her grass have been destroyed, and her only companions are ducks that come and go in her enclosure. The winter in Chile has also been very hard on her, with temperatures dropping into the low 30s (Fahrenheit) at night for 3 months out of the year. Some elephants tolerate the cold better than others, but Ramba does not do well, she shakes with the temperature drop, and takes a while to warm up. Ecopolis continues to try to raise funds for her care, which include paying for her hay, her pelleted elephant food, vet visits, lab work, fruits and vegetables, caregiver staff, and other dietary supplements, but they still are trying to get her to sanctuary, and that is where Brazil comes in. 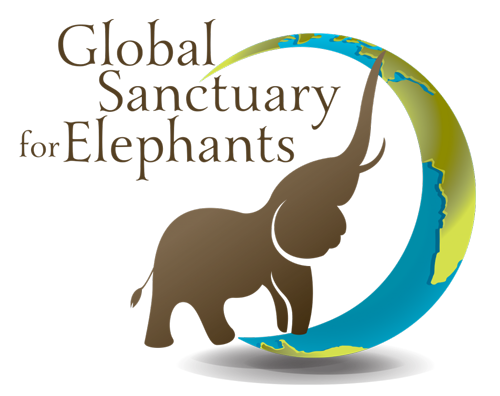 The Elephant Sanctuary Brazil is a completely viable alternative for Ramba that would allow her just what Ecopolis has always wanted for her and what she deserves. Because of Brazil’s central location, it is feasible to have Ramba travel to Brazil and live out her life with other elephants, roaming through pastures and forests, enjoying a life of retirement. In the meantime, Ecopolis could use help supporting Ramba and paying for her care. 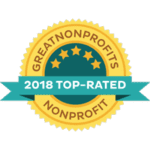 Ecopolis not only works to help Ramba, but they also fight for the rights of Carriage horses, feed, vaccinate, spay and neuter the stray dog population, and have many other animal projects that they are working on and need to support. Their funds are spread very thinly between all of these projects, and we would like to be able to help. With the initial plan being that Ramba would only be at Parque Safari for a short while, the costs of taking care of an elephant have become more than initially anticipated, and for such a small NGO, they are becoming a struggle. Ramba is an utter gem of an elephant. We often joke that the individuals working with her in Chile probably think that is what all elephants are like. Although she initially responded to someone coming close by ducking her head a bit, squinting her eyes, as if ready for an impact, she has never acted out towards anyone. Ramba was an elephant that although loves human interaction and appreciates human companionship, does not long for human touch. She enjoys the company but does not desire to be stroked as many elephants do. You can touch her; it’s just not something that she necessarily looks for. Positive reinforcement training was easy for her to pick up on, she was a very quick learner. Training is done with a bamboo pole that has tape attached to the end, so it looks like a giant q-tip. It’s an amusing image, but it can be an issue for an elephant who was abused, to see something that in the past could have been used to inflict pain, as a positive object. Ramba took to it with no problems; she was very quick to trust and seemed to immediately realize that no one there would hurt her, that was a thing of the past. Ramba has numerous scars and old abscesses from chains and bullhooks on her body, and her muscle mass was very low initially due to lack of exercise, but her body condition has improved since her relocation in 2012. Unfortunately, the outer scars are not the only physical remnants of a hard life. When Ramba first arrived at Parque Safari, we noticed that her urine had no color to it, it was completely clear. It immediately raised red flags, but we thought it was possibly temporary, and that she just needed a clean supply of readily available water. Because of the concerns, urine samples were analyzed, and indications were that it could be a more substantial problem. After being conditioned for blood draw, through positive reinforcement training, blood samples were collected to see what was going on internally. Her results showed that there was truly a larger problem; Ramba suffers from chronic kidney issues, most likely due to years of lacking in one of the most basic needs there is- clean drinking water. We continue to work with Ecopolis on trying to find ways to support her body and make things easier on her kidneys, speaking with numerous vets, and coming up with a plan that includes dietary changes and supplementation. Ramba continues to look healthy, her appetite is good (she actually will eat almost anything), and she is still active and playful. This is just one of the things that will have to continue to be monitored and supported for her entire life. Ramba will rumble, but does not vocalize in other ways (no squeaks, burps, trunk pops, whistles, etc.) and we are hopeful that when she is with other elephants, this will change. She is an amazing elephant that completely captures the heart of anyone who is fortunate enough to spend some time with her. We would love to be able to give her a permanent home where she can live out her life as a member of a herd, with access to hundreds of acres, where she won’t have to ever live through another cold winter. That is where Elephant Sanctuary Brazil comes in. Because of Brazil’s central location, it is feasible to have Ramba travel to Brazil and live out her life with other elephants, roaming through pastures and forests, enjoying a life of retirement. In the meanwhile, Ecopolis could use help supporting Ramba and paying for her care. Ecopolis not only works to help Ramba, but they also fight for the rights of Carriage horses, feed, vaccinate, spay and neuter the stray dog population, and have many other animal projects that they are working on and need to support. Their funds are spread very thinly between all of these projects, and we would like to be able to help. With the initial plan being that Ramba would only be at Parque Safari for a short while, the costs of taking care of an elephant have become more than initially anticipated, and for such a small NGO, they are becoming a struggle. Not only is Ecopolis providing food for Ramba, but they are also providing medical care for her as well. It was discovered this year that Ramba has kidney issues, probably due to lack of available fresh water while with the circus. To help ensure her well-being, and make necessary adjustments to diet and treatment, blood samples have to be checked regularly to monitor the progression of her values. She has needed some dietary adjustments, limiting calcium and lowering protein levels, so this has meant adding fresh oats and bran. Ramba’s diet also consists of approximately 20 lbs of fresh fruits and vegetables daily, along with hay. We would love to be able to get a better quality, more appropriate hay for Ramba. Grass hay is only available in the very south of Chile, and it is expensive, so she currently eats alfalfa, which is both higher in calcium and protein than we would like, and less appropriate than grass hay. Winter is just leaving Chile right now. Ramba’s grass has been worn down over the almost 2 years that she has been living there, so supplementing with a quality hay is essential. Alfalfa is good, but with her kidney issues, it is not ideal. There is also an option to raise money for a full-time caregiver for Ramba. There are workers at the Parque Safari, but they have other animals to take care of, so their time is limited and Ramba’s needs require a lot of time. Between continuing PC (protected contact) training, footwork, feeding, offering warm water from the hose numerous times a day (very important to aid in flushing out her kidneys), cleaning, cutting branches for her, and general care, she needs someone who can dedicate numerous hours to her each day. Right now Ramba currently has two vet students volunteering their time to care for her, and it would be nice to be able to offer them some compensation for their time or even just pay for their gas. With no one currently supporting Ramba, besides Ecopolis and limited individual donations, this is all a very tall order. The other issue we are running into is availability of supplies. With no traditional medication available for an elephant with kidney issues, herbal medicine was the next choice. Ecopolis cannot get the recommended herbs for Ramba’s treatment in Chile, so they are being shipped from the US. This is proving to be quite expensive and difficult. Her initial package of herbs, that was sent expedited mail, is still in transit 2 weeks later. Along with paying for the herbs and shipping up front, there will also be an import charge once it arrives in Chile. Luckily there is a generous couple that donated her first batch of herbs, but this is a problem we would run into if anything was sent from the US. There have been numerous supplies Ecopolis has had trouble finding, and when they do, they often have to be shipped from somewhere else. Many times our first choice is not available and research has to be done to find something comparable that is available in Chile. Getting the appropriate supplies for Ramba has been difficult and is why there are no direct buying options on her wishlist and why there are transport costs added to most of her items. 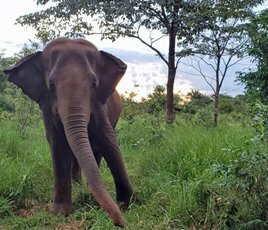 We ask that you help support Ramba now, before she makes her journey to sanctuary, to try to ensure that she continues to be healthy and will be able make Brazil her final home. If you would like to help take care of Ramba, even before she arrives at Elephant Sanctuary Brazil you can either check out the wishlist for pricing and items needed for her daily care or go to our donate page and select Ramba’s Care from the dropdown menu. You can even list what specific item you would like your money to go towards. She could use your help. It is mid-spring in the southern hemisphere and the temperatures have finally begun to rise in Rancagua, Chile. To some that just means t-shirt weather, but to Ramba it means so much more. There are several ways in which the winter has affected her physical being. She has a decrease in muscle mass from spending more time in her barn trying to stay warm, and less time walking around her yard. She loses the benefit of engaging certain muscle groups entirely, that during the summer months, she uses climbing in and out of her pond. Her enclosure lacks any natural vegetation through the winter. Ramba is fortunate enough to have grass to graze on during the warmer months, but it all dies back during the winter, creating a need for additional dietary supplementation that cannot compare to the benefits of natural grazing. Most simply, Ramba does not tolerate the cold well; she begins to shiver once the temperature drops into the low 50’s. When some elephants shiver, it is barely noticeable; Ramba does full-on body shakes. All of this shivering, to try and heat her body, uses energy that her body can’t really spare. With her kidney issues, her body needs to use all of its energy on trying to heal and stay healthy. But the weather has turned, her grass is green and almost long enough for her to graze off of. She was able to enjoy sleeping out under the stars for the first time since last fall. Instead of spending most of her days in her barn, she now basks in the healing warmth of the sun. The safari park’s owner, Ivan Sanchez, now has two of his employees helping with her care and dedicating more time to her, one of them being their resident vet. They are continuously looking for ways to keep her mind and body busy. If you look along her fence line you will see ears of corn and other vegetables that are good for tying, hanging every 12 feet or so. Big branches of willow (a favorite) are cut regularly and placed throughout her enclosure, and tall grass is cut and delivered to her from other areas of the park. She continues with her positive reinforcement training for footwork, blood draw, and medical treatments. Ramba has been enjoying the benefits of the fresh water that is now piped to her barn. She receives baths, which she has decided are a treat, and drinks directly from the hose numerous times a day, to ensure she is properly hydrated and her kidneys are assisted in flushing out toxins. Swimming is still out of the question apparently, but only until the pond warms up a bit. We continue to treat Ramba’s kidneys with herbal supplementation and monitor her health closely. She has received two injections of vitamin B-complex, and will get another one in two weeks. Ramba surprised her caregivers by being wonderful for her IM injections, acting like she didn’t even notice that anything had been done. As we’ve said before, she is truly a gem. Plans are to repeat her blood work next week to see if her diet changes and herbal supplementation have caused any sort of improvement in her blood levels. One of the unfortunate situations for elephants is the limited protocols for the use of traditional medicine to treat certain ailments; this is the case with Ramba’s kidney issues. We have adjusted her diet to the extent possible given the limitation and parameters in Chile, fresh water has been plumbed to her barn to help increase her water consumption and we are incorporating other modalities including herbal supplementation to try to support and aid some of her body systems. The best thing about it warming up is that Ramba looks much brighter. She had a very sullen appearance during the winter, a dullness to her eyes, a more hunched posture- but all of that has changed. There is now a playful brightness to her eyes, she is more engaging, and even a little more vocal. This past winter was definitely a little bit of a struggle for her, and we are hoping that she will never have to go through another one, that by next winter, she will be calling Brazil her home. We will continue to keep you updated on Ramba, her health, and any interesting happenings. Follow link above to read about our visit to Chile to check on Ramba’s health and weight loss, and what was found. Also learn about elephant footwork, see before and after pictures and watch a short video of how it is done.